In 1837, Bryant Durant moved from Massachusetts to northern Illinois. The prairie farmhouse was constructed just prior to his marriage to Jerusha Shurtleffin 1843. The Durants had six children, all of whom were born and raised in the little brick house. In the 1880’s Godfrey and Christina Peterson purchased the property, and they added a modern Victorian kitchen to the house. The addition is still present and is interpreted as part of the tour. They also had six children. The Durant-Peterson House was rescued in the early 1970s after decades of neglect. Visionary members of a local Questers antique study group recognized the homestead’s value as a vital part of our shared history and completed an authentic restoration in the mid-70s. Today, the Durant House is recognized as Kane County’s own “Little House on the Prairie.” The Museum can be enjoyed in all the seasons, with special programs throughout the year designed to highlight a prairie family’s routines of work and play. A visit to the house offers a unique history experience. Costumed docents bring the past to life interpreting the prairie pioneer experience in this nationally recognized historic site. The Durant House Museum beckons visitors of all ages to come enjoy a trip back in time. These hands on history programs are on specific Sundays during the year, open to the general public and are used to highlightaspects of prairie pioneer life. This winter program is a favorite for families as a way to beat cabin fever! Visitors of all ages will get a enjoy playing various 19th century games like Nine Mens Morris, Checkers and Skittles. This program will allow visitors to see, touch and learn about the building tools and implements that were necessary to build a pioneer homestead like the Durant House in 1843. Learn some of the stunning secrets of this little brick and wood house; how it was built and what was used to build it. How were fabrics made in the 19th century? This program will highlight and showcase a variety of pioneer-era textile processes. Visitors will see how linen comes from flax, how a spinner takes sheep’s wool and makes it into yarn and the weaving techniques to make straps. Visitors will not want to miss a chance to try weaving on the loom! This program is a must for anyone learning about or interested in textiles from the 19th century. The homestead will be filled with aromas of vinegar, spices and herbs during this program. Visitors will be shown the importance of certain tasks of pickling that allowed foods from spoiling. Visitors will get to ask questions and learn pickling techniques that they can bring home to preserve all their summer produce! This program will be presented in the 1840’s hearth room and in the 1880’s Victorian kitchen. Getting back to basics by learning about making bread and butter by hand is what this program is all about. These tasks, done weekly, were essential for any farm family, not only fulfilling the family’s needs but also for bartering too. Visitors will be able to help in the process of churning cream into butter and get a chance to see old butter molds and stamps on display. No batteries or power cords at this program! Visitors will discover how buildings were made without electricity. Tool experts will give demonstrations on certain tools and how they worked. Visitors will get a chance to test their strength to see if they had what it took to be a carpenter in the 19th century! 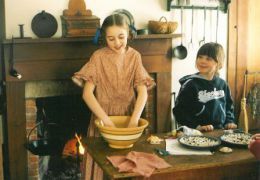 Visitors will experience the house bursting with activity and wonderful smells as staff prepare an autumn supper in the fireplace on the hearth and in the 1880’s Victorian kitchen. Visitors will be able to ask questions and use all their senses to see this autumnal supper come alive! This program is great for any fan of cooking and 19th century cooking techniques. Apples are the star during this fall program. Visitors will witness the making of various foods incorporating apples using the hearth in the Peterson kitchen. Visitors will not want to miss the rare opportunity to see and sample a vintage variety of apples not available at supermarkets. Celebrate the coming of the Christmas season the 19th century way. For many in the Fox Valley area this event is a must for starting out the holiday season. Visitors will enjoy a fire, the smell of evergreen in the air and spirit of Christmas cheer all around. Visitors will not want to miss the music in the parlor, the beautifully decorated tree, tasty sweet treats and the twinkling of candles in the window. For specific dates on programs, please check our calendar. For all programs, please note a $3 per adult & $1 per child donation is appreciated. Adult docents help during regular public hours, school and group Living History tours, and for seasonal programs. Prior experience is not necessary. Full training is provided. A corps of junior docents serve as adjunct staff during public hours and special events, helping share the 1840's prairie life with visitors. Learn more here or contact our director at 630-377-6424 or email durantandsholes@ppfv.org.